Get updates on your lock screen for upcoming appointments, or when new appointments or customers are added. Notifications are alerts that appear on your phone’s lock screen, which update you about new and updated appointments and customers. Many businesses have more than one admin and multiple staff members who have access to modifying appointments and customer data. Activating your notifications will help you stay on top of all activity and updates related to your Setmore account. 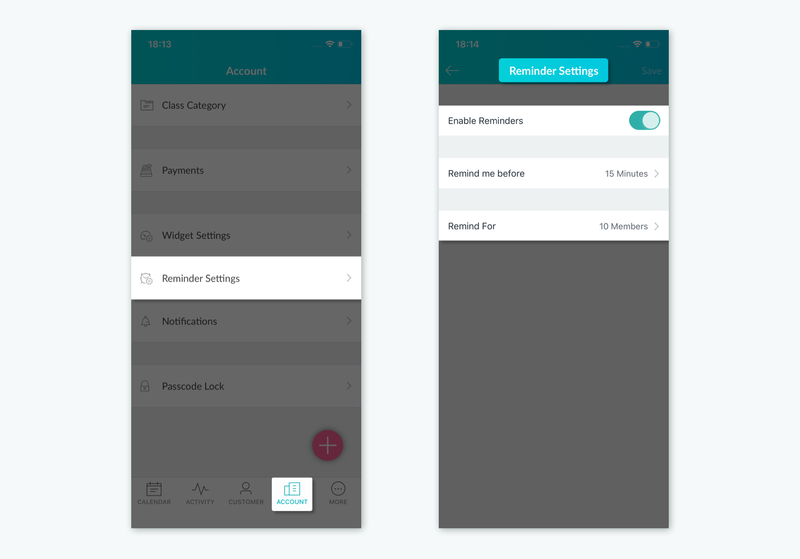 The Setmore mobile app gives you greater control over in-app reminders for your upcoming appointments. You can set reminders to show during a specific timeframe, and show reminders at a specific time before each appointment. In the bottom navigation bar, tap on Account. In the Account menu, tap on Reminder Settings. In the Reminder Settings window, use the options provided to customize your experience. Turn reminders on or off: You can turn off reminders if you find them too distracting. Remind me before: Determine how soon before an appointment you’ll receive the reminder. Remind for: You can make these settings apply only to your user profile, or to every user profile within this Setmore account. In the bottom navigation, tap the Account button. 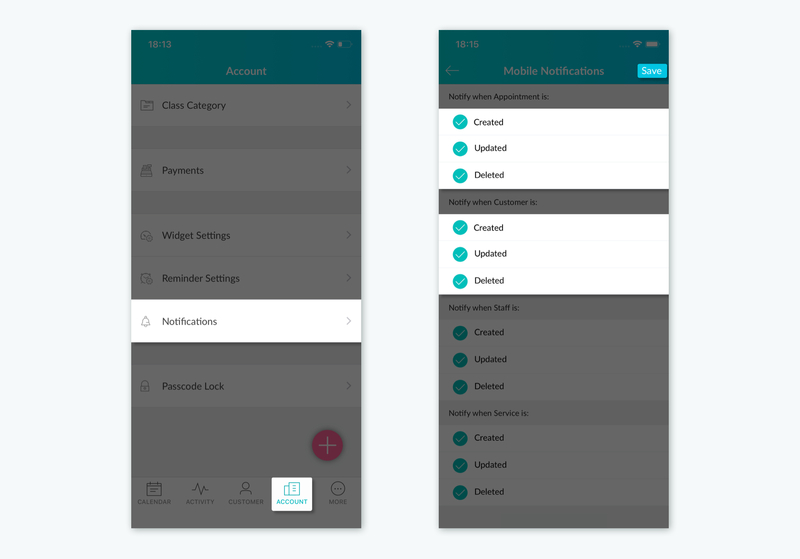 In the Account menu, tap Notifications and tap Mobile Notifications. You may be prompted to adjust your phone's settings to enable push notifications for Setmore. Otherwise you will see the different notifications you can enable. Simply tap each alert type to activate or deactivate it, then tap Save. Note: You’ll need to make sure your phone’s hardware settings allow notifications from Setmore to receive any updates or alerts on your phone’s lock screen. By default, all Setmore accounts are set to receive notifications related to adding, deleting and modifying appointments and customers.